It’s that time of year again. And that only means one thing: time to start thinking about the holiday baking. In Paris, bakery windows fill up with Bûches de Noël (Yule log cakes) and bourriches (wooden crates) of oysters are piled up at the markets. The chocolate shops are crammed with people, buying multiple boxes as gifts, and people splurge on caviar and Champagne, one of the few things that go on sale in France during the holidays. One thing you don’t see is the use of pumpkin in desserts. A tart or pie (or ice cream) made of squash might sound funny, especially to non-Americans, but helps to remember that pumpkins, and other squash, are technically fruit. One could also point out the classic Swiss Chard Tart from Provence (which is in a whole other category), and Melanzane al cioccolato, eggplant with chocolate sauce, which I like. (Which one could argue is good because it’s smothered in dark chocolate.) 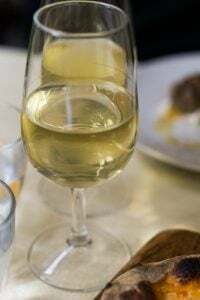 But I don’t think everything goes with chocolate: A friend tried the hot chocolate with oysters at a famed chocolate shop in Paris, and after her description, I wasn’t rushing over there to try a cup. 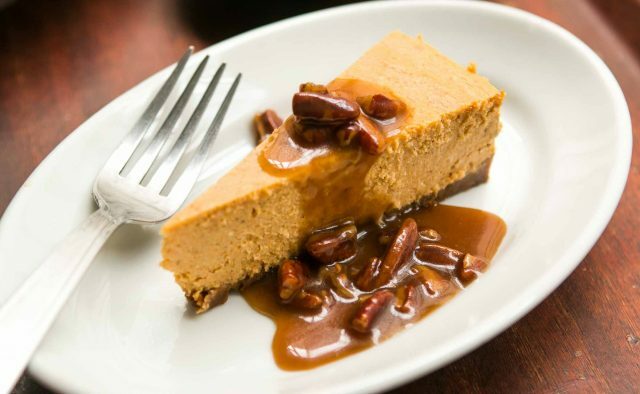 To get that last image out of your mind, I present pumpkin cheesecake with a pecan praline sauce, that has nothing not to like about it. Cream cheese and sour cream, a buttery cookie crust, and a brown sugar and bourbon-tinged sauce loaded with crunchy pecans. I’m in. DIYers may raise an eyebrow at using canned pumpkin. I’ve got a few reasons for using it. (And as many of you perhaps know, it’s not made from pumpkin, but a variety of squash similar to butternut squash.) One, is that when writing a recipe, it’s easy to get consistent, similar results when we’re all using the same ingredient. And two, it’s a heckuva lot easier, which is appreciated around the holidays when all of us have enough on our plates, and in our ovens, and it’s fewer dishes to wash to boot. In the meantime, I’m standing over my stove, stirring warm, just-toasted pecans into my praline sauce before lacing it with a dash of bourbon. The praline sauce is decidedly on the sweet side. But that didn’t stop me (like, at all…) from dipping my spoon into it over and over and over again. Be sure to toast the pecans before using them. My pet-peeve in restaurants is when they don’t toast nuts. Toasting any nut usually improves it by at least 99%, if not more, so if you’re not consistently toasting your nuts before using them on salads, sauces, and in ice creams, start doing it now. It’s not too late. But I can’t imagine this cheesecake being served without it. Although I could imagine eating the sauce without the cheesecake. And if you’re anything like me, you might find yourself spooning it over ice cream, ladling it over pumpkin pie (without the marshmallow topping), or even spooning it right into your mouth, like I do. 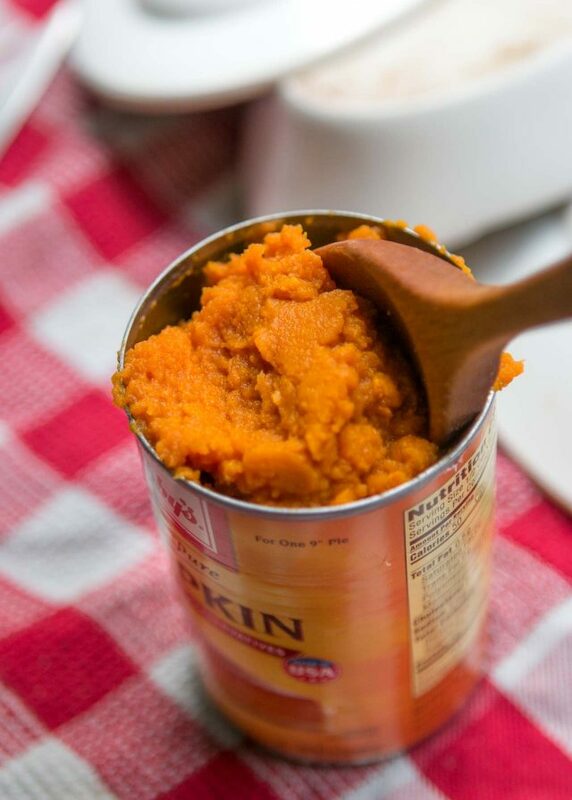 Make sure if using canned pumpkin, that you don't use canned pumpkin pie filling (which is sweetened and spiced); you want to use canned pumpkin, which is 100% pumpkin puree. If you want to make sugar pumpkin puree yourself, you can find instructions here, or make butternut squash puree by splitting a squash lengthwise and scraping out the seeds. Butter the cut side of each side of the squash, and bake the two squash halves, cut side down, on a parchment-lined baking sheet in a 375ºF/180ºC oven until very tender, about 35 to 45 minutes. 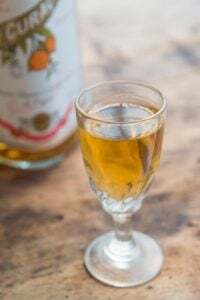 When cool enough to handle, scoop out the flesh and puree in a blender or food processor, or pass it through a food mill.If you want to balance the sweetness of the sauce, you could add a scant teaspoon of apple cider vinegar or lemon juice to it, or to taste. Conversely, adding more liquor will take the edge off as well.Outside of the U.S., I often use speculoos cookies in place of the Graham crackers for the crust. If you go that route, you might want to reduce the butter in the crust by about 20% since speculoos cookies tend to be more buttery than Graham crackers.I use a glass-bottom springform pan for cheesecakes, which makes serving them much easier. 1. 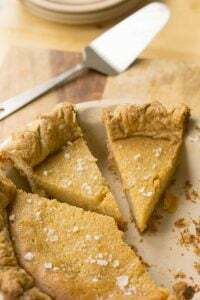 To make the crust, in a medium bowl, mix the Graham cracker crumbs together with the melted butter, sugar, and cinnamon until the crumbs are thoroughly moistened. Butter a 9-inch (23cm) springform pan then press the crumbs evenly across the bottom of the pan. Refrigerate until ready to bake. 2. Preheat the oven to 350ºF (180ºC). Bake the crust until it feels set in the center, 10 to 12 minutes. Let cool on a wire rack. Turn the oven down to 325ºF (165ºC). 3. To make the filling, in the bowl of stand mixer fitted with the paddle attachment (or by hand, in a large bowl), beat together the cream cheese, sugar, and lemon zest, until smooth. Add the eggs one at a time, stopping the mixer between each addition to scrape down the sides of the mixing bowl, then add the pumpkin puree, sour cream, cornstarch or flour, and vanilla extract, along with the spices and salt. 4. Line the outside bottom of the springform pan with foil so it reaches all the way up to the top of the outside of the pan. If you have to use several pieces, I recommend triple-wrapping it to prevent leaking or water getting in the cake pan. (Better yet, use extra-wide foil, so you only need one sheet.) Scrape the mixture into the prepared springform pan and smooth the top. Place the cheesecake in a larger pan, such as a roasting pan, then add very warm water to the larger pan until it reaches halfway up the outside of the cake pan. 5. Bake the cheesecake in the oven until the center feels just slightly set, about 1 hour, to 1 hour and 15 minutes. Remove the cake from the oven and let sit in the water bath for 30 minutes, then remove the cake from the water bath and let cool completely. Refrigerate for at least 4 hours before serving. 6. 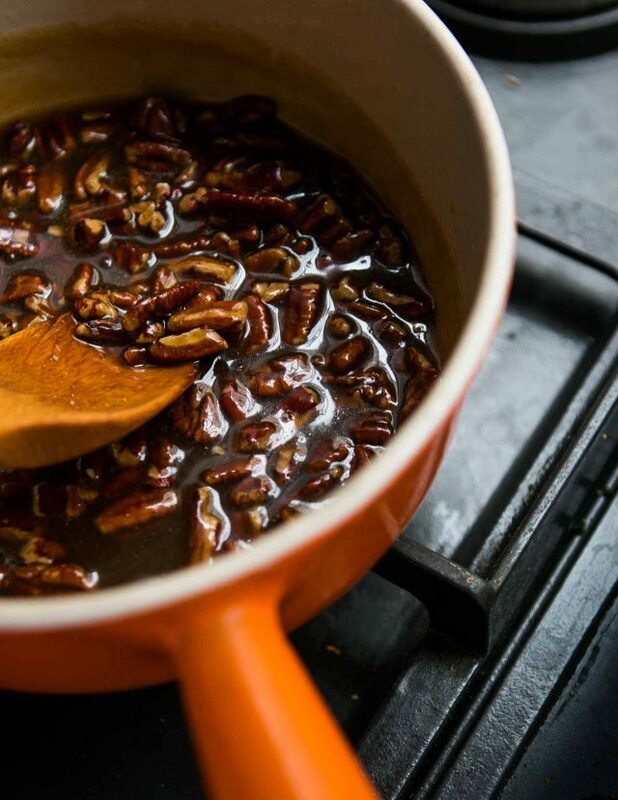 Make the pecan praline sauce by heating the brown sugar, cream, butter, maple syrup and salt in a medium saucepan over medium-high heat, until it comes to a boil, stirring frequently. Let boil for 1 minute without stirring. Remove from heat and add the bourbon, pecans, and vanilla. Serving: Run a sharp knife around the outside of the cheesecake to release it from the springform pan, then remove the sides of the pan. Dip the knife in warm water, wipe it dry, and use it to cut clean slices from the cheesecake. Serve with a ladleful of warm sauce poured over it. If the sauce gets too thick upon standing, you can thin it with milk or water. Storage: The baked or unbaked crust can be made up to three days ahead and stored at room temperature (if baked), or refrigerated (unbaked). It can also be frozen either baked or unbaked for 2-3 months. The baked cheesecake will keep for up to 4 days in the refrigerator. Also, I didn't know glass-bottom spring pans exist and of course want one now! This looks delicious! How far in advance can I make the sauce? At least a week – keep in the refrigerator and rewarm before serving. Hi David – this looks wonderful! Can we use (homemade) creme fraiche in place of the sour cream? When I first moved to Germany, I brought back canned pumpkin from the US because all you can get here – still – is fresh or pickled. When I learned to roast a pumpkin, that took care of carting the cans back here. But yes, it is inconsistent as there are so many kinds of pumpkin! Never heard of glass-bottomed springforms! Make your own pan–LOL! Your desserts never fail to please. In fact, for our daughter’s wedding this summer, the only wedding cake she wanted was your Almond Cake. I baked TEN of them! They looked spectacular at the farm to table dinner, all done up in fresh flowers and powdered sugar. Inspiration from you!Your blog was cited on their wedding website. This cheesecake sounds scrumptious. I have found that a gingersnap crust goes really well with pumpkin. Can this be made in a regular pie pan? I don’t have a springform pan. If not, I can just make the sauce! It looks delicious. 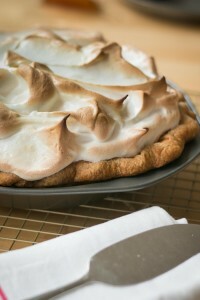 Yes you can use a pie pan but it won’t take as long to bake so check it much earlier. Be sure it’s well chilled before slicing to serve it, the first piece will be difficult to get out nicely. The recipe looks fantastic BUT your newest book is what I must comment on by saying it is a wonderful read. I feel like I am living your travails with you. Your ability to engage the reader be it with your blog posts or your books is a gift. Bravo…. Definitely decadent ( and will raise blood sugar!) but who is counting when it’s Thanksgiving?!? I’m sure you’ll cringe when I tell a brief story about a cheesecake I made earlier this fall because a close friend has serious gastric issues and is not only gluten free, lactose intolerant–to the chagrin of her family and their tastes. To keep this short, I used the -gasp- fake stuff–tofutti cream cheese and sour cream. With all the other ingredients, it tasted exactly like the real thing. 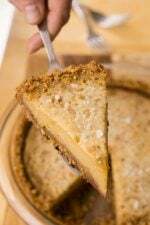 The crust was toasted finely ground almonds made like the graham cracker crust. She was happy and really appreciated it. This method wouldn’t suit many people and I would certainly make it with the real stuff again, unless she was coming to dine—or for those who keep kosher and separate meat and dairy. But your recipe is now under serious consideration and will consult with my daughter Leah on it for Thanksgiving! I’m big fan of you, the cake looks wonderful!!!! I just wanted to know if I can use a butternut squash (have it baked before) because we do not have canned pumpkin in Lithuania. Wow that looks yummy. For folks in the US they can buy Dr. Pete’s Mustard Parline Sauce Really good if you can’t wait to get to the cheesecake. I will be making your cake this year. The recipe I have been making is so complicated it takes hours. Also got your new book from Amazon yesterday and started reading last night. Love it! Can’t wait to make the flatbread. How timely! 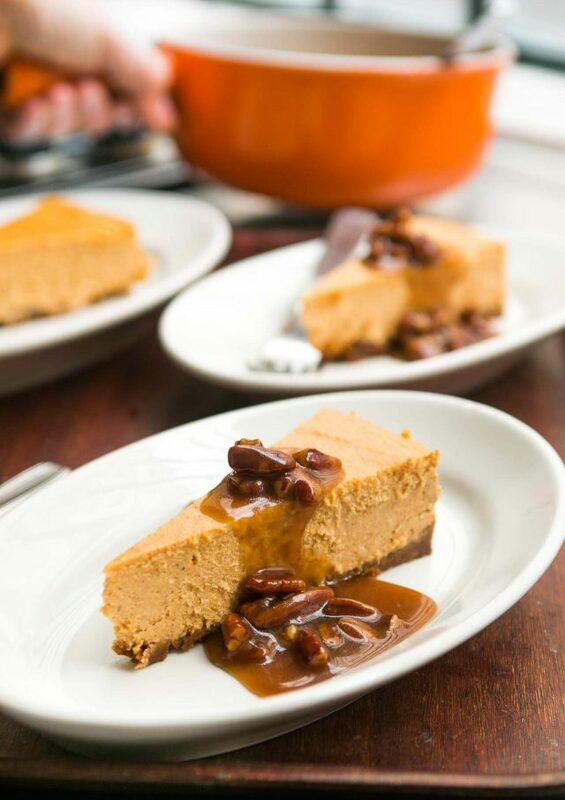 I’ve been looking for a pumpkin cheesecake recipe to make for Thanksgiving, and this is exactly what I wanted. Thanks! Hi David, I have been a big fan of your blog since 2002 or earlier, from Tokyo. Each time I read your posts, I always have so many new things to learn but from this post :) And from this post, I decided to toast the nuts each time I use them – not only nuts but sesame also gets better, I think, so I will start toasting sesames as well. 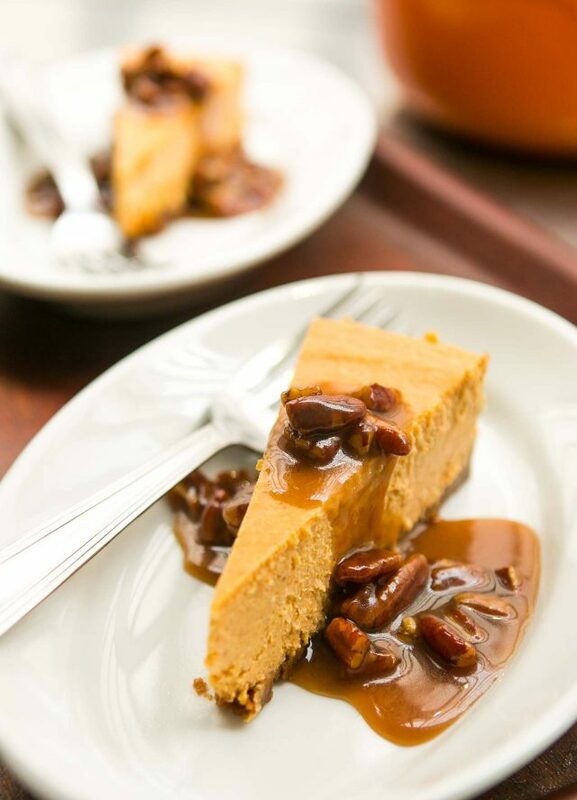 Thanks for good post as always :) This pumpkin cheese cake looks so delicious…! Connie: You could but I found after a number of taste tests, that I prefer sour cream to crème fraîche in cheesecake (which makes is more dense and a little too-tangy, to my taste). But if you want to use it, it’ll work fine. erika: Yes, I mention in the headnote before the recipe how to use butternut squash. chris: You could but you’d have to cut down the amount of filling since it’s for a springform pan and a pie plate or pan would hold a lot less filling. Hi David, I love cheesecakes. So far mines are Vanilla and citrus, quite classic. Yours is appealing for a change although I am surprised you use canned pumpkin and Auchan cream cheese. I am a fan of quality ingredients, rather homemade or organic. 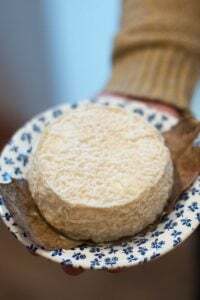 With Terroir d’Avenir rue du Nil, I have access to wonderful old fashioned Pumpkins and quality cheeses. So I’ll try your recipe with these ingredients and let you know. Just before the recipe, in the headnote, I mentioned that outside the U.S., speculoos are a good alternative (and perhaps reducing the butter a bit in the crust, since they’re moister than Graham crackers.) You can get pumpkin puree at shops like The Real McCoy, Thanksgiving, and La Grande Épicerie. I don’t know whether one can get tinned pumpkin here in the UK – I’ve never looked, to be honest! I don’t think I’ve ever tried pumpkin for the sweet course – I love it too much as a vegetable! In the UK, biscuit crumb bases are usually made with digestive biscuits, or possibly Hob Nobs, but ginger nuts are my preferred alternative (I use them if and when I make a banoffee pie, which I definitely prefer). 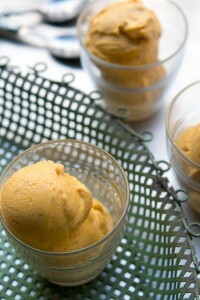 Hello David, did you ever try to bake cheesecakes with speculoos as a base? :) for me this delicious spicy belgian biscuit is great with this kind of pudding and quite popularly used as such in Belgium. I will try your recipe using ‘potimarron’ a variety of squash that seems to be less known in the anglo-saxon world. Yes, I mentioned in the headnote before the recipe (and in response to Maja’s comment, just above) that you can use speculoos in the crust in place of the Graham crackers. Potimarrons are wonderful. In the U.S. they’re called “kuri” squash. I’m going to use potimarrons for the cheesecake too. I love them. I find that a mix of speculoos and Traou Mad cookies is better than straight speculoos (which, as you say are not exactly like graham crackers; I think they have more butter/fat even though they are very crispy and easy to crumble). Thank you for this recipe! A friend brought a pumpkin cheesecake to work many years ago and I still dream about it. I asked for the recipe, but he had made it up on the fly. Nothing I have tried since has been as good. I hope your version is the one of my dreams. As I am French, I am not sure of the right French term : is it a courge butter nut that I have to use ? And what is sour cream in France if it is not crème fraîche ? Homemade butter and cream cheese? Not a problem! Make my own cooking pan? It wouldn’t be the first time! Make Deb’s graham crackers from scratch? Nope. Can’t do it. I always eat all the dough. That stuff is CRACK! Made this the other night – it turns out dense and gloriously tall! Thanks for a great recipe. David, what’s your rule of thumb for toasting nuts? I did mine in a convection toaster oven at 325 F for only a few minutes and they tasted just a tad burnt/overcooked. Better to carefully warm them in a pan on the range maybe? Wondering what, if anything, to use in place of the bourbon? 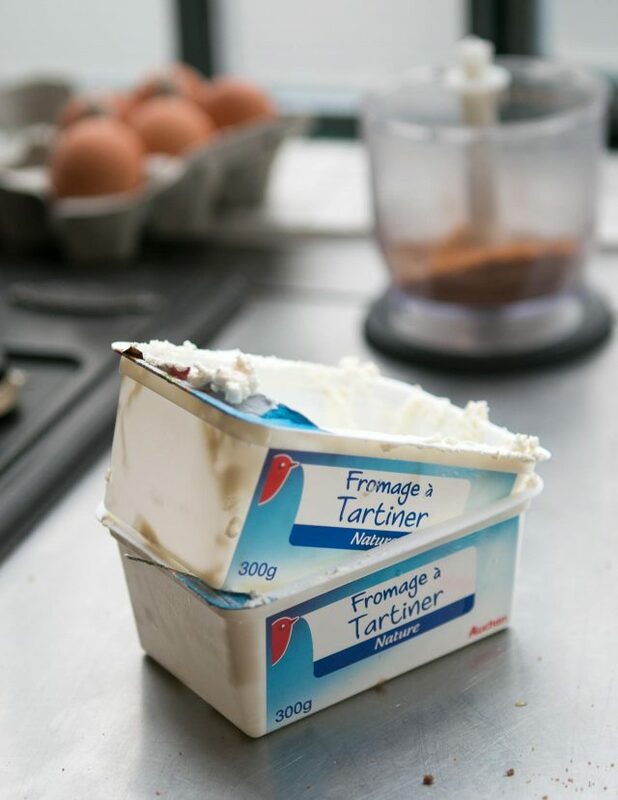 A bit worried it will be too sweet without adding something…..
Emma: Crème fraîche has a lot more butterfat than sour cream (30% versus 18%, more or less) so I prefer to use something like fromage frais or even Bridelice in place of the sour cream. 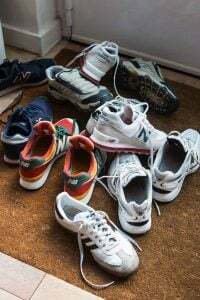 There are more tips on substitutions here. Jon: I toast nuts for about 10 minutes in a 350F/180ºC oven, on a baking sheets, stirring once or twice while baking. If yours are burning after a few minutes, at a lower temperature, you may want to get an oven thermometer and check the temperature of your oven. Some people do toast nuts in a skillet, but I find they tend to get dark spots on them and don’t toast as evenly. Nancy: I knew that question would come up and was considering including a swap-out in the headnote to the recipe but I couldn’t think of one. 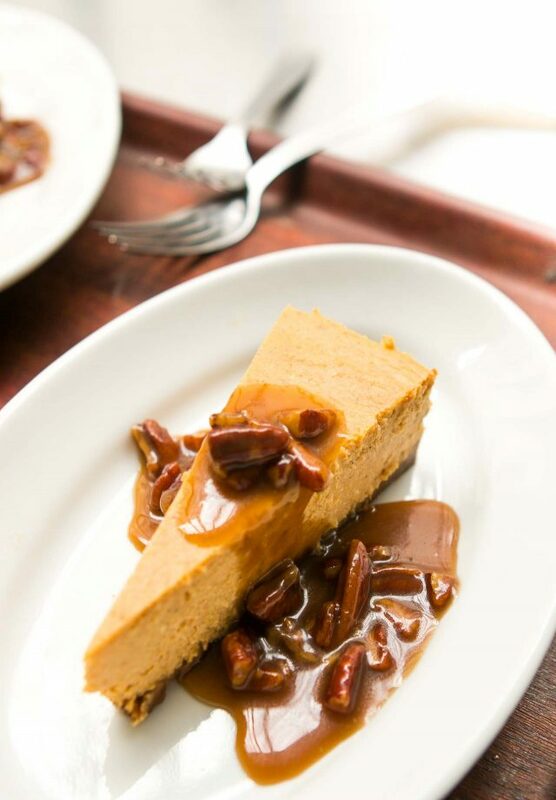 You could serve this with a caramel sauce, and add toasted pecans to it. I have a recipe in Ready for Dessert or you can find one online. Hi David, I love this recipe and can’t wait to make it! How long would the pecan sauce last in the refrigerator? I plan to make it ahead and warm just before serving. It will keep for at least a week, perhaps a few days longer, although the pecans won’t remain as crisp the longer you keep it. Hello David, I know you are busy with your book tour, but wondered if you are still using the Canon 70D? I have a 60D and would like to upgrade. Thanks if you see this message! Oooh, my new winter cheesecake recipe — can’t wait to try it. And thanks so much for your wonderful new book. I have to slow down reading it or I’d quickly devour it — just like one of your many delicious recipes. Congratulations on the birth of l’appart! David, can’t wait to read and listen to L’appart! In this recipe, now that I have baked my crust, I now realize that I SHOULD have lined the bottom of the springform pan first! This despite reading the recipe over several times. Maybe move those instructions to before the crust-baking directions? 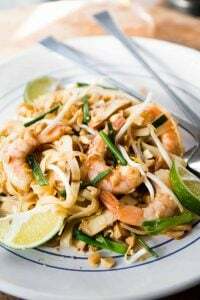 Always your loyal fan, many of your recipes (properly credited of course) on my family recipe blog. You line the outside of the pan with foil, not the inside. The crust is pressed directly into the buttered pan (no foil or parchment underneath it), then you wrap the outside/bottom of the pan with foil, and make sure it goes up the side. Hope that helps! Now I understand. Wrapped the pan as you directed and the cheesecake was spectacular, the hit of Thanksgiving. And yes, I did catch someone with a spoon and the jar of praline-pecan-bourbon sauce! Hi David, It’s so hard to narrow down to one recipe from your Thanksgiving recipes post! We are cheesecake lovers so am going to give this a whirl, but I”m still thinking about apple cake too : ) . I have a 10″ springform pa,n since the one we make often is large. How should I adjust the baking time to accomodate? Congrats on the book! Most springform pans, it’s you carefully measure them, are often closer to 9.5 inches, due to their being made outside the U.S., so they are sometimes in metric, and 9-inch is what they are labeled in the U.S. market. I don’t think you’d have to make adjustments; but since it might be less thick, you may wish to cook is slightly less. This is cooling as I write and I’m Wonder if it’s possible to freeze the backed cake? Is there anything special to freezing a while cheesecake? Thanks! Being under 21, can I just leave out the bourbon in the pecan praline sauce or would you recommend substituting something else? I can’t think of anything to substitute for it. Sorry! 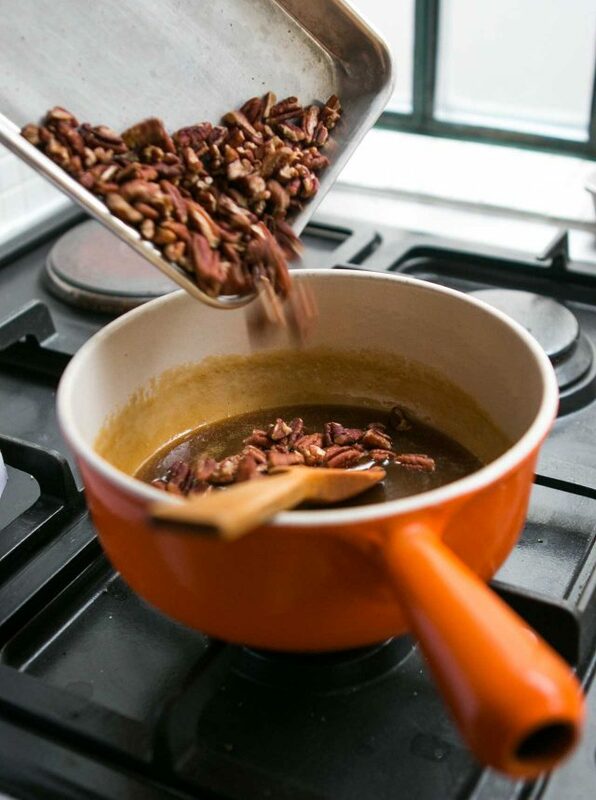 You could make a standard creamy caramel sauce and stir in pecans. I have a recipe in my book The Perfect Scoop for a caramel sauce like that, but you can also likely find one online. I omitted the bourbon and just used a couple of teaspoons of rum essence – no alcohol and for this kind of use tastes like the real deal. I found it at the supermarket alongside other flavouring essences for cooking eg peppermint essence, almond essence etc. How long do you toast the pecans? 350° for 3 to 4 minutes? Do you use oil or butter? Whoops! When I was publishing this post, my server went down and took a few of the metric conversions with it. I added them back. Thanks! Also, I tend to prefer light brown sugar for this although dark is fine if you want a stronger flavor and darker color. Splendid. I am making this beauty for Thanksgiving out of town. I don’t know if the Praline Sauce will travel well. Once cold, I will pour it in a Mason jar. Et voila, on verra! Is 9″ the correct pan size for the listed cooking time range? I have one in the oven now, but the 9″ spring-form is filled very close to the top. This does not seem to match the final thickness I expected based on the glamour shots. The link for a glass-bottom pan is 10″ which makes me wonder if 10″ was the intended size for the recipe as well? Because the pan I use isn’t made any longer, I linked to that one (which is slightly larger, and inexpensive), which will work just fine. Although we don’t celebrate Thanksgiving in Australia, and use of pumpkin in desserts generally earns one a few sideways glances, as soon as I saw this recipe I knew I had to try it – and boy am I glad I did! A-mazing! I usually find baked cheesecakes quite stodgy, but the filling in this is something else – so light and delicious. Speculoos biscuits worked perfectly for the base. And that sauce! Oh my lordy!!! I will just have to try it swirled through vanilla ice-cream. Another great recipe, David. H David, made this pie today for Thanksgiving. Followed the recipe to a T, lined the outside of the pan, put in water bath in oven for 70 mins and let it rest in the water bath for 30 mins after we took it out. Left in fridge over night. 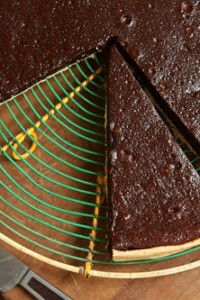 The outside looked gorgeous and firm, but when we cut into it today, the middle/inside was unmanageably soft and gooey. It was impossible to cut a piece, since the inside part just sort of poured out. Tasted great but was not very pretty and ended up everywhere :/ Not sure where I went wrong. Sound to me like your oven may be off. (I keep a thermometer in mine to make sure it’s accurate.) Other commenters – Robert O, Michael, + Jon, reported it came out well for them. Hey David. Thanks for the excellent recipe made this for Thanksgiving today and people really enjoyed it. I did forget to pre bake the crust by accident but it turned out alright anyways… perhaps a bit less crisp then if I had remembered to bake it but certainly didn’t ruin anything. I also used spekuloos (sp?) cookies from Trader Joes instead of graham crackers. I didn’t have a glass bottom springform pan so I just use a regular all-metal springform and that worked out fine. Just had to be careful not to scratch the interior when I was cutting the cheese cake. I didn’t have a big enough roasting pan for the water bath so I put it in a large cast iron skillet and that worked out fine. People also loved the bourbon sauce! David, I made this Pumpkin Cheesecake for Thanksgiving dinner yesterday. It turned out beautifully. I cooked it for an hour 10 min. Firm and very silky. Thanks for the recipe! I made this for Thanksgiving at my sister’s house last night. I was told to bring “only pie” but I had to make this too. It was a huge hit…truly delicious. Definitely a recipe I’ll add to my repertoire. I used a biscoff cookie crust, which was perfect. And the praline sauce! No words. Wow! I made this and it turned out great! The bourbon sauce was really decadent, and if that weren’t enough, I had a bowl of whipped cream to dollop on top of the warm sauce. Made this for Thanksgiving in Italy with 18 international guests and it was a big hit with all. I made this for Thanksgiving and it was fantastic! I baked it for 1 hour and ten minutes. I made the crust from “Biscoff” brand speculoos cookies. This was my first time making cheesecake and it came out great. I used a plastic serving utensil to keep from scratching the bottom of the pan when serving. The sauce was outstanding and the small amount leftover very easy to reheat the next day. THANK YOU for such a great recipe David! I have a very similar recipe in a Nov, 1990 issue of Gourmet, and it uses 3 lg eggs. What will 4 eggs do to the cheesecake? The key ingredients are the same. I remember making it with 3 eggs twice, and it is very light and wobbly. Yours looks more dense. Could it be the amt of the eggs? Thank you! I made this and it turned out fantastic! I tweaked the crust (used the Simply Recipes version with pecans and used gingersnaps instead of graham crackers) and made your caramel sauce instead of the praline sauce. I will add that while it’s likely my oven temp, I noticed the middle was still quite loose after an hour and 15 minutes, so I baked for another 30-45 minutes before turning the oven off and letting it cool inside with the door propped open for an hour or so before letting it cool on the counter. Hi. I made your sauce with the cheesecake. Yours looked thicker than mine. Way thicker! I ended up taking a little cornstarch diluted with the sauce. It did thicken more, but yours looks seriously better than mine. Tastes good though, yummy even! I’m wondering if I didn’t let the caramel cook long enough before you add the rest of the ingredients. Oh well, it’s going to the party with imperfect sauce. Thank you! The sauce will thicken if let to sit. So you could make it in advance, but it can also be cooked a bit further, until it’s almost as thick as you’d like, but it’s hard to tell when it’s still warm how thick it’ll be, once it cools down. I plan to make the sauce as Christmas gifts. It was fabulous! Must it be refrigerated? Could it be canned in a water bath? I think you could leave it out of the refrigerator for a certain period of time, but I would store it in the refrigerator if it’s not going to be used that day, or maybe the next. I’ve not canned it but you can check here for guidelines on canning and see if they offer up a method or technique. After researching this question, I’ve concluded that one cannot water-bath can caramel sauce. The product is not acidic enough to kill off botulism spores. It may be possible to pressure can it, but it is not recommended for the home cook. So, best to eat it up or freeze it for longer term storage.